Welcome to BLOG Zentangle. To learn about Zentangle, visit our website, read our free newsletters, take a class with a local Certified Zentangle Teacher (CZT), and best of all . . . create your own! I ordered the Zentangle kit about a month ago and have enjoyed drawing all the patterns in the kit and new ones from your newsletters. I am a gourd artist, so immediately I thought about doing Zentangle designs on a gourd. I did not use a "string" but drew each pattern separately without thinking which one I would do next. As I went around the gourd my creativity keep flowing until I had 14 different patterns. I tried to make each one flow into the other. Essentially, each pattern was drawn twice; once in pencil then again with a wood burning pen. All the shading was done with different wood burning tips using low, med or high heat. The higher the heat, the darker the color. The bottom of the gourd is stained with black gourd ink dyes and then sprayed with acrylic. The New Mexico Gourd Society had their festival this weekend so I entered it into competition. I won "First Place in the "My Masterpiece Master Gourd Artist" division and the "Viewer's Choice" award which is voted on by the public. Everyone wanted to know how I did it. I had many questions and the first thing I did was to tell them to go to Zentangle.com! 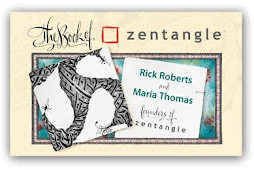 Thank you Maria and Rick for what will be many years of Zentangle! Now, take a look at these images! Those pictures are so beautiful. Thanks, Barb. We've invited Barb to check this post's comments in case you have any questions for her. Wow, these are gorgeous and so creative! Wow . . . those are just GORGEOUS in all caps! Outstanding Zentangles!! Absolutely beautiful! Congratulations on your two ribbons. Definitely deserving of those ribbons!!Fabulous!!! I have some native made gourds with zentangly type designs. I always wondered how they were made. I would have never thought of a wood burning tool. I'm blown away, this is amazing! Thanks so much for sharing. Really awesome! I have never seen gourd art like that before, mostly the kind of art that is painted on with acrylic paints. Other than drawing your prelimenary design in pencil, are there other preparations you do to the gourd before you use it as your ground to receive your art? Also, do you use special kinds of gourds or will any kind work for your art? Thanks for sharing your gorgeous gourd. It is beautiful! Phenominal! The designs just glow. Absolutely beautiful! Thanks for sharing your incredible work; wish I could see it in person. This is for Bonny, The only preparation I did was to apply some gourd wax to the surface. This was done to soften it up a bit to receive the ink dye. I live in New Mexico and things get pretty dry here. I buy most of my gourds from the Welburn Gourd Farm in CA because they are nice and thick; www.welburngourdfarm.com but most gourds will work fine if you are just wood burning. The thicker ones are great for carving out patterns. Thanks to all for your interest in my gourd art. This is just spectacular. I have seen the zentangles used in other mixed media projects, but this takes the case. I can see why your gourds would win awards, they are very unusual, contemporary and sleek. Not what I usually think of gourds. Wonderful work! Now, Rick and Maria, I think my Zentangle kit is broken. My has done nothing even remotely close to this and I have had it for maybe two months. Absolutely beautiful! Congratulations on your awards! So beautiful! I mean "gourdeous". Great job incorporating one pattern into the next. those are just SO AWESOME!!! Congratulations on your ribbons. This work is incredible. OMG! this is BEAUTIFUL! I am a newbie and just checking all the blog news to learn more about what has been going on. This gourd work is ART! love your work! Our first book . . .
. . . is now available! How do you say . . .
A, Bee, Z . . .
Three for Friday plus . . . Anything is possible . . .
is an easy-to-learn, relaxing, and fun way to create beautiful images by drawing structured patterns. We believe that life is an art form and that the Zentangle method is an elegant metaphor for deliberate artistry in life.